Contact Us – Ask the makers of the lightest mobility scooter! Mobility Scooter Brands – What makes SmartScoot™ different? Can I fly with the SmartScoot ™ electric travel scooter? Can I take a foldable scooter on my next cruise? Is a mobility scooter a wheelchair? SmartScoot is the folding mobility scooter designed for the those who have active lifestyles. Mobility scooters can be heavy, large or unwieldy, making them difficult to use when shopping or even on smaller sized public sidewalks. SmartScoot is compact, lightweight and easy to use. When folded up, with the seat and battery removed, SmartScoot fits inside the trunk of a small car. The heaviest piece weighs in at 27lb. Despite a compact, lightweight mobile scooter design, the SmartScoot is robust, with a carrying capacity of up to 300lbs. 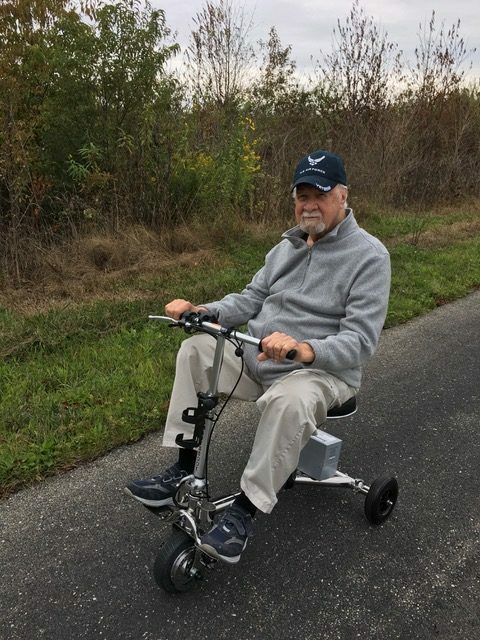 Brian on his new SmartScoot on the walking trail. Today I did not have to go by myself! So far so good… we have developed a technique for getting it in the trunk of the Prius, we both have tested it out in our long country driveway (paved), and we are planning a trip to the art museum next week. It is stable and sturdy – we were actually pleasantly surprised at how well it is made. So far so good. Thanks for all of your assistance in helping us make the decision. Contact SmartScoot today with any questions you may have about the SmartScoot folding mobility scooter. © 2015 An ASP Global Company.